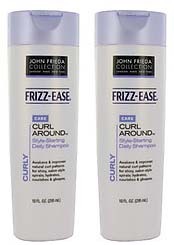 Glosses for shiny spirals controls frizz. Follow-up with this professional curl-defining conditioner. Developed for wavy, curly, frizz-prone hair, this Style-Enhancing Conditioner energises your natural curl patterns for smooth spirals, with lasting definition. Formulated with moisturising conditioners, firzz-fighting silicone, and a curl-defining complex it hydrates for well-defined, frizz-resistant curls. Safe for natural or colour-treated hair. For daily.